Remember when the Blonde Ambition tour made a pitstop in Bosch's depiction of Hell? When I saw previews for Immortals last year, I was on the fence. Visually, it looked quite appealing but it felt like an obvious attempt to ride the coattails of the Clash of the Titans remake. I certainly didn’t expect a quality film, but figured I’d get some awesome special effects and cool scenery. Here we are, nearly six months later - I’ve finally had the chance to view the film and it completely lived up to my expectations. It also managed to put to rest an old saying I’ve been using for years. You see, Immortals has proven beyond a shadow of a doubt that you can, in fact, shine a turd. This movie is plenty shiny, but despite its undeniable beauty, they don’t make air freshener strong enough to get the stench out of your living room after you’ve watched it. The story is loosely based on some Greek myths. It’s been quite a while since I read any of that stuff, but I recognized some of the more famous elements, such as the minotaur with the barbed-wire helmet, the Matrix-style fight scenes, and the bow that shot electric arrows from the Dungeons & Dragons cartoon. Anyway, the tale is told from long ago when magic ruled the air and the Immortals made war amongst themselves. The winners ascended to godhood while the losers got locked in a big stone box under a mountain and were called Titans, which his actually a way cooler title than “gods” anyhow. The Epirus bow was lost in the battle and years later, King Hyperion decides he wants to find it in order to release the Titans and spite the gods for failing to save his family. Anyway, Hyperion wages his war but there is one man who stands against him. A man with no interest in heroism, but has no fear, save the fear of his loved ones being hurt. This man is Theseus (Henry Cavill) and when his mother is slain before his eyes by King Hyperion, his devil-may-care attitude is thrown out the window like yesterdays soiled toga and it’s on. The gods themselves cannot interfere, but Theseus hooks up with a master thief (Stephen Dorff) and a smokin’ hot oracle (Freida Pinto) and together they attempt to find the Epirus bow and stop King Hyperion before he can unleash the wrath of the Titans. 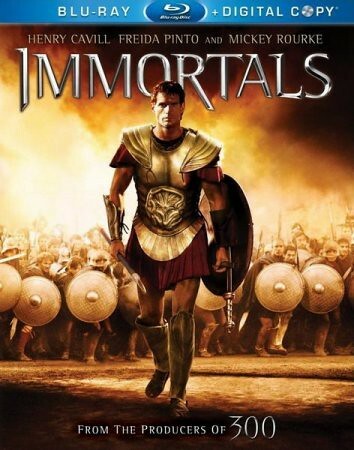 Immortals was directed by Tarsem, whom some of you may remember as the guy who directed the video for R.E.M.’s Losing My Religion - this movie kind of looks like that video, if you combined it with Zack Snyder’s 300, anabolic steroids, and some windowpane acid. Apparently Tarsem wanted to create an action film which resembled a Renaissance painting and there can be no doubt that he achieved this goal. The entire thing is an absolute marvel to behold and left my eyes and brain thanking me for granting it the opportunity to behold such a wonderful vision, especially in the glory that we humans may only refer to as “1080p, widescreen 1.85:1 aspect ratio with Dolby 5.1 digital sound”. However, my brain did not thank me for subjecting it to the mind-numbing boredom that accompanied this film. With thin characters and a plot that didn’t really make a lot of sense, 2/3rds of the way through the movie, I found myself surfing the internet and looking up when the music got dramatic so I could see what kind of violence might ensue. That’s not exactly the desired effect of an action movie, but it’s about all I could muster for this one. The Blu-ray is accompanied by a digital download and a few extras including an alternate opening and ending, deleted scenes and a couple of documentaries. Hopefully the 3D version comes with a bong and a bag of weed, because having watched this movie stone-cold sober, I was really wishing I had something to enhance it a little. Honestly, if this country never legalizes marijuana for medicinal purposes, I hope the Powers-that-Be will eventually see fit to legalize the herb for recreational film watching. I just can’t believe Tarsem didn’t want me to be high when I watched it and who am I to deny a director his vision? If you enjoy watching fantasy movies while stoned out of your gourd or if you ever had a desire to see gods depicted as dancers from an early '90s Madonna tour making an unscheduled stop in a Hieronymus Bosch painting (which is a pretty awesome sight, I’m not gonna lie), then Immortals is the movie for you. I do not have the words to express, nor does my mind have the capability to comprehend how a film can simultaneously be both a must-see and not worth the price of a rental, but somehow Immortals manages to be that film and we are all the better (and worse) for it.